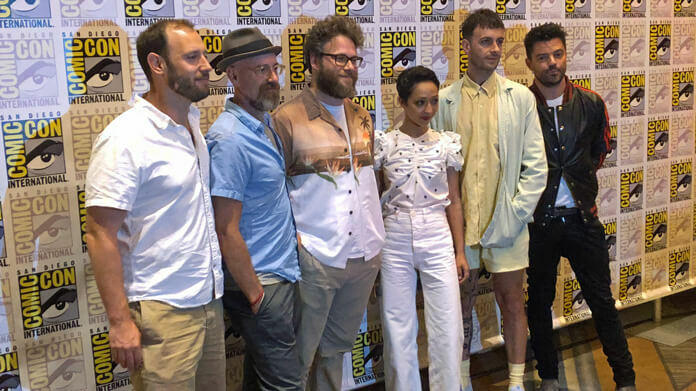 The stars of AMC’s Preacher – Dominic Cooper, Ruth Negga, and Joseph Gilgun – joined series creators/executive producers/writers Sam Catlin, Seth Rogen, and Evan Goldberg at the 2018 San Diego Comic Con to promote the show’s very twisted third season. In addition to hosting a Q&A with fans, the Preacher team participated in a press conference to delve deeper into what’s up with Jesse, Tulip, and Cassidy this season. 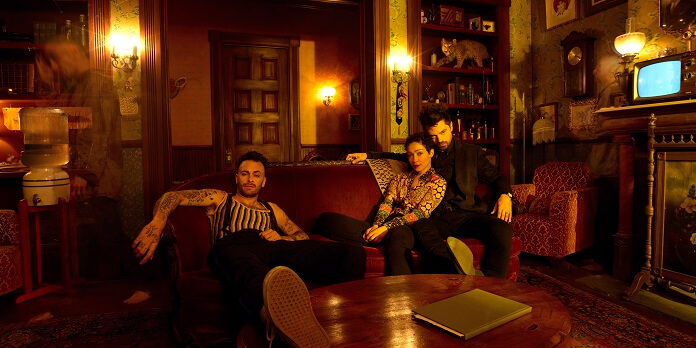 Joseph Gilgun joked that Jesse and Cassidy’s relationship is one of those where they can have long conversations and never agree on a single thing. That said, the two seem to fit together and Gilgun believes each will give the other a second chance at friendship. Among the third’s season batch of bizarre new additions is the character of John Wayne. While locked in a coffin underwater, Jesse retreats from reality to have a conversation with the legendary Western actor. Sam Catlin revealed they weren’t going to put in John Wayne from the comics at all, but ultimately decided to bring the character to life during season three. Seth Rogen believes inserting John Wayne in the first season would have been too much on top of all the other weird characters and storylines. Negga also believes that the Purgatory scene was a watershed moment for Tulip. She feels Tulip has now become her own superhero. Cooper admitted it’s been challenging to play the version of Jesse who enjoys The Tombs. “That’s been a very interesting part of playing the season out is how much he has to restrain himself from indulging too much in the brutality of it. I keep re-watching them having made them and there are things that he’s done that are just utterly awful. You see him as a child and you think the decisions that he maybe was forced into making, they’re really quite terrible things and awful memories to live with. But it definitely colors certainly the audience’s perception of who he is. As for how closely the season will hew to the source material, Catlin confirmed the comics are in the writers room and are a constant source of inspiration. “I feel like this season there’s probably more stuff that’s directly from Garth (Ennis) and Steve (Dillon’s) writing than in the previous two seasons. We’re hoping to get to all of it or as much as we possibly can. It just takes time. “I’m glad I’m a poor man’s Bono,” joked Gilgun. Preacher airs on AMC on Sundays at 10pm ET/PT.